Use search to find just the content you want. When you start a search, all items are displayed in the results the Search window. Use keywords and filtering to narrow your search. In the upper left panel, click the Search icon . The Search window appears. Enter your keywords in the Search field. Items containing your keywords appear in the window below. To narrow your search results, do any of these things. To filter for a specific type of content, click 1 of the notes, tasks, files, or comment icons. 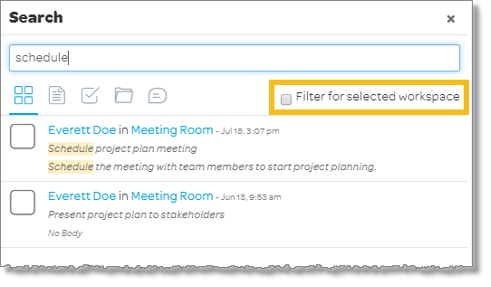 To filter for results in your current workspace, check Filter for selected workspace. When you click on a note, task, or file in the search results window, the item opens in a new window. To open the item in its workspace, at the top of the item window, click the Go to Workspace icon . When you click a chat comment in the search results, you’ll see the comment appear in the workspace where the comment was added.